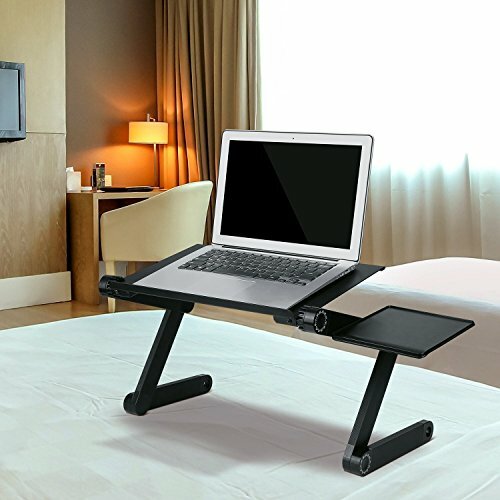 ★This Homfa Portable Laptop Table Desk combines style and functionality to create a modern home furnishing ideal for use in living room, bedroom or any other space when you use a computer, eat breakfast or read a book. ✔Good Material: Made of Aluminum alloy, very lightweight, sturdy and portable. ✔Stylish and Useful: Panel with ventilation holes helps the computer dissipate heat in time. Also well match with your furniture in your home. ✔Practical Design: With its unique design legs you can adjust angle, height and tilt that suits you best. Suitable for Laptops/Notebooks/Tablets/Magazines/Books/iPad etc. Side Stand to hold mouse, light, phone, speaker etc. ✔Easy to Install & Clean : Easy to assemble with the hardware, also with the smooth surface, easy to keep clean and maintain. ✿Panel dimension: 16.5" * 10.2"
✿Folded dimension: 20.9" * 10.2" * 1.6"
【NEWLY DESIGN】Unique ratating legs design adjusts angle, height, and tilt from the same three pivot points. Create an ergonomic environment on-the-go for office work, school work, at a library, in a car, coffee shop, home,etc. 【HIGH QUALITY】Practical and contemporary design, made of lightweight strengthened aluminum for firmness and stylish look. Up to 20kg/44lbs load is sturdy to withstand nearly any laptop or tablet. 【MULTI-PERFORMANCE】The extraordinary locking button that can be set in full 360 degree angles to fit any body position for a maximum range of potential configurations. Raise your tablet for a standing position or lower it for sitting and laying down. 【INTIMATE DESIGN】Two black non-slip baffles can prevent the computer sliding. Baffles can efficiently and safely handle the whole frame of a laptop computer, giving you an easier time when tapping at the keyboards. 【PRACTICAL TABLE】The tray is 16.5 inches wide which fits many laptops, notebooks, and tablets on the market. Vented design prolong your computer's life, it requires no assembly, small in volume, easy to take and use. Tray Folding size: 20.9"L x 10.2"W x 1.6"H(53cm X 26cm X 4cm). If you have any questions about this product by Homfa, contact us by completing and submitting the form below. If you are looking for a specif part number, please include it with your message. WELLAND Multi Tasking Bed Serving Tray,Laptop Desk for Bed (Grey) 16 1/2" x 12 1/2" x 3 3/4".